The street slopes gently and is lined with closely spaced houses lacking a unifying arboreal or architectural theme. Red brick and black painted shutters, white colonial clapboards, and a lone inexplicable single-family Tudor style on the corner. Oak and apple trees have seen better days. An occasional Japanese maple tree, its leaves more violet than red, sits on a postage stamp patch of grass. It’s still a safe enough place that a child could venture out alone and walk up the street and to the left–past that curious Tudor–to a small playground that was, unlike the neighborhood, distinctly unsafe in retrospect. The metal swing set squeaked as its rusty chains protested being anchored to concrete. No soft landings. I broke my nose playing kickball on that playground. Twice. As dawn was breaking every Easter morning, I slipped out the dark gray front door of my house, adjusted my home-crafted white felt bunny ears–though no one would ever see me–and began my delivery loop to the front stoops of all who had signs of young children in residence. As far as I know, no one ever learned my true identity. Baby sitter pay in those days ran 50 cents an hour in the better parts of town. Weekly allowance was of comparable heft. I would hoard my money starting at Christmas, at the latest. To be acquired: woven pastel baskets, mint green raffia to line them, lavender ribbon, speckled candy eggs, foil-wrapped chocolate bunnies, improbably-colored tiny wire and feather chicks, plastic eggs, and colorful yarn that I painstakingly tacked on with pasty white glue to sign as my cotton tailed persona. And the pièce de résistance: the sparkling, utterly inedible hollow sugar eggs. About the size of my childhood fist: piped sugar frosting as solid and dentally-imperilling as concrete lined the egg’s portal, a window on a watercolor spring scene. When I married and moved to downtown Boston, circumstances did not seem quite right to resume my spring calling. It was unclear to me if any of the fast-moving city dwellers actually was harboring babies or toddlers within the taller and yet more tightly-packed residences in our new neighborhood. It seemed yet more unlikely that anyone would welcome anonymously-delivered baskets. During our early married life, my husband’s New Hampshire relatives would make sure we traveled to their house for Easter. His aunt was more culinarily challenged than most of his relatives–though not nearly as much as I–but it was, of course, the thought that counted (just as it was when a relative of mine attempted to cook Thanksgiving dinner, only to have my father-in-law gingerly extricate from the thoroughly-cooked bird a plastic bag of giblets when he discovered what was holding up the carving process). And my husband Jim, who would describe himself as a man of faith but not so much of a man of rituals, did attend Easter services. Our first son’s first Easter was spent in the segregation unit of St. Michael’s church, behind a presumably soundproof clear wall. The priest’s voice alone was piped in. Without the congregation’s communal vocal support it could not escape any of us young parents that he was comically atonal. Our second son’s first birthday fell on Easter Sunday. He gleefully began walking that day, his smiling eyes the robin’s egg blue of his cotton polka-dotted jumper. By the time our second daughter arrived, we were living in an old house on land filled with country critters. Wild turkeys would pop up in the mist and walk single file across the lawn. Around Easter time, elaborate nests would be assembled on our porch, soon to be filled with speckled blue eggs. 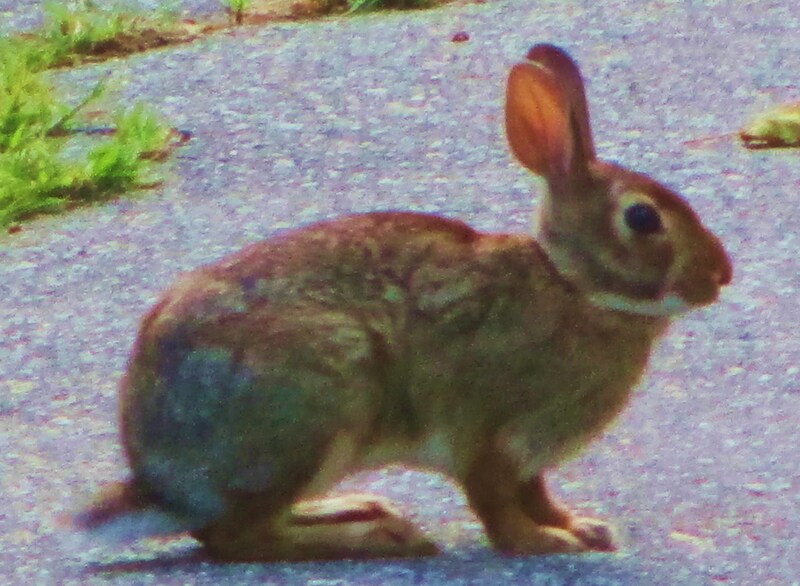 Brown bunnies would scamper up to Jim’s flower beds and our children would stand stock-still and try not to startle them. When our children were joined by batches of cousins, Easter Sunday was always an occasion for family feasting. Mountains of plastic Easter eggs were hidden on my in-laws’ lawn and inside their home, and collected in pastel baskets by children no wiser to the Easter bunny’s true identity. It seems to me now that Easter is something like baseball. True, its religious component is far more significant . . . although I have known some truly reverential Red Sox fans. But the love of baseball isn’t just about baseball, and Easter’s significance isn’t solely holy. Both are about family, about rituals and traditions which are meaningful because they’re anticipated and experienced together. They are communal experiences. They are about the pauses, the spaces, and the quiet opportunity to contemplate as much as the bursts of song and sound. And they are both about joy, about moments of unbidden magic even in the most trying times. This entry was posted in Love and Loss and tagged Easter, family, the Easter Bunny, tradition. Bookmark the permalink. My son’s birthday is tomorrow…my second daughter was born Easter Monday – about 15 minutes after Easter Day concluded. More coincidences we share! Easter itself is sort of a hodge podge in this country, sacred blended with secular and utterly confusing. I find it simpler, after 47 years of being church-bound all Holy Week, to finally celebrate Spring itself; no small miracle that event! Easter egg hunts at Grandma and Papa’s! Miss those days. I remember after the diabetes diagnosis Mom started putting tickets in the eggs, and would stand at her prize table doling out prizes when they cashed in their tickets. My little ones loved that!!! The bunny has been here and tucked away some eggs here and there, but it’s nothing like a good old egg hunt with the cousins. Lovely, lovely, lovely. As always, I drift to other times and other places through your words. I had no idea you were a Bunny! Happy Easter – and thanks for the memories. We did make one Easter Egg hunt (since we usually went to TX for the holiday) and it was great!! what a lovely set of memories you’ve woven together. Just like those first easter baskets.